Lung cancer is a malignant tumour of the lungs. Most commonly it is bronchogenic carcinoma (about 90%). Lung cancer is the most lethal malignant tumour worldwide, causing up to 3 million deaths. Exposure to carcinogens, such as those present in tobacco smoke, immediately causes small changes to the tissue lining the bronchi of the lungs (the bronchial mucous membrane). This effect is cumulative, and over time with continued exposure more and more tissue gets damaged until a tumour develops. If the tumour grows inwards it may obstruct the air passageway, causing breathing difficulties. The lungs may then collapse and infections can develop, leading to lung abscess. The patient here would start to cough up blood-stained material. However, if the tumour grows outwards in to the lung it may not even be noticed by the patient before it starts to spread to other parts of the body. Depending on the type of tumor, so-called paraneoplastic phenomena may initially attract attention to the disease. In lung cancer, this may be Lambert-Eaton myasthenic syndrome (muscle weakness due to auto-antibodies), hypercalcemia and SIADH. Tumors in the top (apex) of the lung, known as Pancoast tumors, may invade the local part of the sympathetic nervous system, leading to changed sweating patterns and eye muscle problems (a combination known as Horner syndrome). There is a error on this page. There are two main types of lung cancer categorised by the size and appearance of the malignant cells seen by a histopathologist under a microscope: small and non-small cell lung cancer. This classification although based on simple pathomorphological criteria has very important implications for clinical management and prognosis of the disease. Small cell carcinoma (also called oat cell carcinoma) is the less common form of lung cancer, making up 20% of cases. It tends to start in the larger breathing tubes and grows rapidly becoming quite large. Epidermoid carcinoma (or Squamous cell carcinoma) also starts in the larger breathing tubes but grows slower meaning that the size of these tumours varies when on diagnosis. Adenocarcinoma (or for slower growing forms alveolar cell cancer) is a form which starts near the gas-exchanging surface of the lung. Large cell carcinoma is a fast-growing form that grows near the surface of the lung. The listed types add up to 90% of all cases of lung cancer. Other forms include carcinoid, cylindroma, mucoepidermoid and malignant mesothelioma. Cancer death rates in the United States. Smoking, particularly of cigarettes, is believed to be by far the main cause of cancer, which in at least in theory makes it one of the easiest diseases to prevent. An estimated 80% of lung cancers result from smoking, due to the hundreds of known carcinogens, such as polynuclear aromatic hydrocarbons present in cigarette smoke. The length of time that a person continues to smoke as well as the amount smoked increases their chances of contracting lung cancer. However if someone stops smoking then these chances steadily decrease as the damage to their lungs is repaired. Passive smoking, whereby exhaled smoke is taken up by other people, has recently been identified as a much larger cause of lung cancer in non-smokers than previously believed. The US Environmental Protection Agency (EPA) in 1993 concluded that about 3,000 lung-cancer related deaths were caused by passive smoking every year, however the true extent is still being contested among scientists. Asbestos is another popularly known carcinogen mainly for mesothelioma (affecting the mesothelium lining lungs, abdomen or heart.) Often this exposure happens unavoidably, as a consequence of people's work. Smoking has been shown to considerably multiply the risk that asbestos exposure will cause cancer. Radon is a colourless and odorless gas derived from the breakdown of radioactive radium, which in turn is the decayed product of uranium, found in the earth's crust. It is the second major cause of lung cancer after smoking. This radiation ionises genetic material, causing mutations that sometimes become cancerous. Radon gas levels vary depending on where you live, and the composition of the underlying soil and rocks. For example, in areas such as Cornwall in the UK (which has granite as substrata), radon gas is a major problem, and fans have to be installed to drive out the gas. In the US the EPA estimated that 1 in 15 homes have radon levels above the recommended standard. Oncogenes are genes which is believed make people more susceptible to cancer. Proto-oncogenes are believed to turn in to oncogenes when exposed to particular carcinogens. Viruses are suspected to cause cancer in humans, as this link has already been proven in animals. Treatments for lung cancer depends on the specific form, how far it has developed and on other details of the patient (eg. age). Common treatments include surgery, chemotherapy and radiation therapy. Radiofrequency ablation is increasing in popularity for this condition as it is non toxic and causes very little pain. It seems especially effective when combined with chemotherapy as it catches the cells inside a tumor - the ones difficult to get with chemo due to a reduced blood supply to the inside of the tumor. It is done by inserting a small heat proble inside the tumor to cook the tumor cells. These are then disposed of by the body through normal eliminative processes. The group most likely to develop lung cancer are the over-fifties who also have a history of smoking. Lung cancer is the second most commonly occurring form of cancer in most western countries, however it is the leading cancer-related cause of death for men and women. 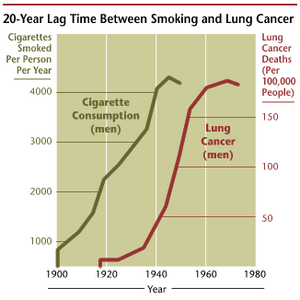 It is expected that in 2001 there will be 169,500 new cases of lung cancer; 90,700 in men and 78,000 in women. Although the rate of men dying from lung cancer is declining in western countries, it is actually increasing for women due to the increased take up of smoking in this group. Prevention plans are the most cost-effective means of fighting lung cancer on national and global scales. While in most countries industrial and domestic carcinogens have been identified and banned, tobacco smoking is still widespread. Fighting tobacco smoking should be primary goal for lung cancer prevention. Because prognosis depends heavily on early detection there have been several attempts at secondary prevention. Regular chest radiography and sputum examination programs were not effective in early detection of this cancer and did not result in reduction of mortality. Computerized tomography (CT) scanning is now being actively evaluated as a screening tool for lung cancer, and is showing promising respults. The National Cancer Institute (USA) is currently completing a randomized trial comparing CT scans with chest radiographs. Several single institution trials are ongoing around the world. A large group of investigators (the International Early Lung Cancer Action Project) are currently collating the results of 26,000 screen detected lung cancers, and are showing excellent preliminary survivals with these patients. More work is needed in this area.